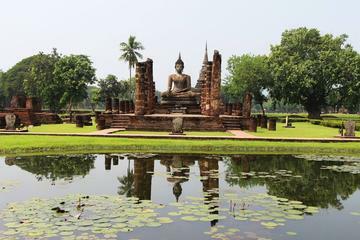 Ayutthaya is located just 80 kilometres (50 miles) north of Bangkok and was the capital of Siam from 1350 to 1767. 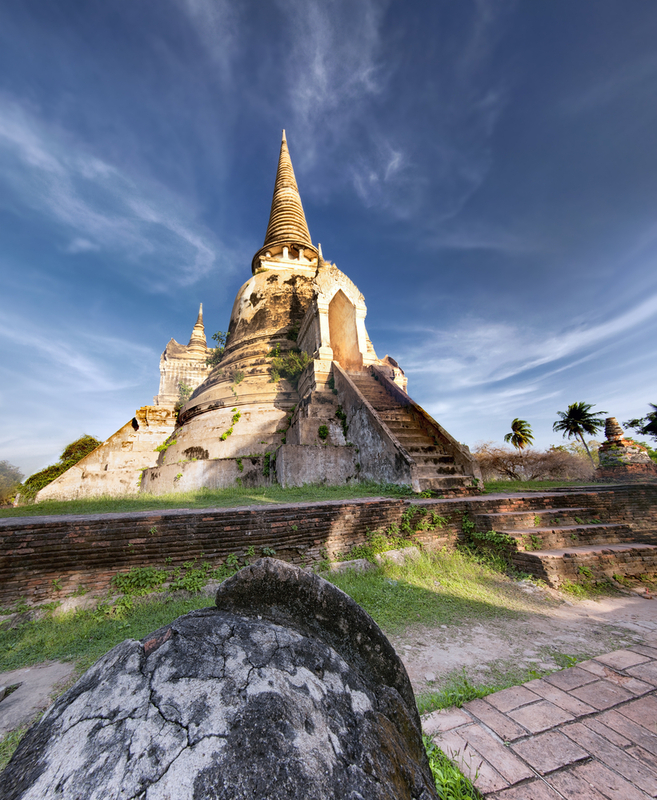 To this day it remains one of Thailand's best known ancient historical sites. By the fifteenth century, the city grew to over a million inhabitants and became the richest in all of Asia, exporting goods such as ivory, animal skins and rice. Not only did merchants arrive from right across Asia but they also came from as far as Europe and the Middle East. Unfortunately neighbouring Burmese armies invaded and began battering the city gates before occupying it during the sixteenth century. After a brief period, the then Siamese took control again, only to lose control once more to the Burmese until finally the Siamese was forced to surrender in 1767. The city was looted and then burned to the ground with much of the population either killed or enslaved. However, most of the monuments were also destroyed and the city lay in ruins and was never rebuilt. Within a year, the city had become a ghost town and the population was reduced to a mere few thousand. Did you know that this great city was technically built on an island surrounded by three rivers, Lop Buri, Pa Sak and the Chao Phraya? Today these ruins still stand alone on the western side of the island, while a new modern commercial town has emerged on the eastern side. This special place is steeped in history and is well worth visiting. Not only does this 7-day tour of mainland Thailand explore its natural and historical highlights, it also adds some off-the-path gems from central and northern Thailand. While much of the journey is by cool, air-conditioned vehicle, you'll also travel by boats, tuk-tuk, and trishaw for an authentically Thai experience. 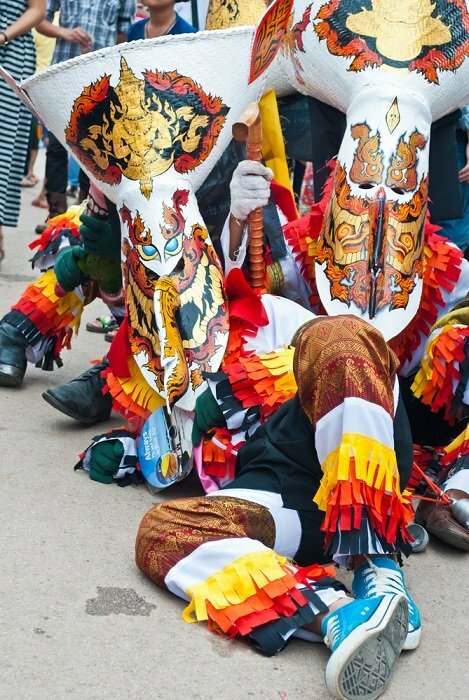 Departing from Bangkok, you'll visit Ayutthaya, Sukhothai, Chiang Mai, Chiang Rai and more. You'll help in the cultivation of rice, visit an Elephant Poo-Poo Paper Park and discover Thailand's traditional Buddhist culture and handicrafts. While Ayutthaya doesn't have an airport to speak of, there are several other ways to take in all the incredible sites, history and ambience here. The nearest airport to this ancient town is the one at Don Mueang in Bangkok but that's still some 60 kilometres away. One of the most relaxing ways is to visit this special place is to take a ferry from Bangkok. Alternatively, you can also travel by train or minibus. 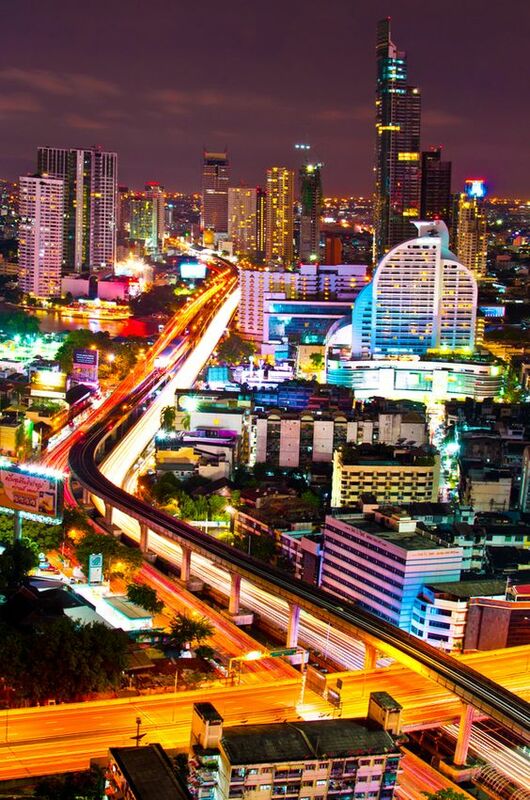 You can reach the ancient city by train from Hua Lamphong station or board a luxury cruiser from the River City Shopping Complex Pier in Bangkok. The ferry will take you to Wat Chong Lom Pier in Ayutthaya and from there it's just a short taxi ride into town. Unfortunately, there are no major public buses travelling to Ayutthaya from Bangkok anymore but there are minibuses that will take you there. You can buy tickets at the Morchit Bus Terminal in Bangkok. The minibuses depart every half hour from 6 am in the morning to 5 pm in the evening. Travel time is around one and a half hours depending on traffic of course. The ferry takes a little longer so it may be in your best interest to go early to avoid disappointment. However, I have a better solution for you to book and pay for your tickets no matter which way you prefer to travel. On my trip there, I chose the ferry. No hassle. This method was recently introduced, it's highly recommendable, it's simple to use. Better than that, it takes away all the worry and you can choose your preferred transportation. All you need to do is enter your details on the platform provided below. There's nothing to lose and everything to gain. Give it a try. You can buy a Train, Bus or Ferry Ticket to Ayutthaya? Booking your tickets from this page (at no extra cost to you) would not only give me a little pocket money, but you'd be helping me maintain this blog so that I can continue giving you more Thailand travel info. There are a great many magical moments to witness here in this part of central Thailand and they range from the historical park itself to the most magnificent architectural wonders seen in the ancient world. Not only will it take your breath away, you are bound to be in awe of everything around you. 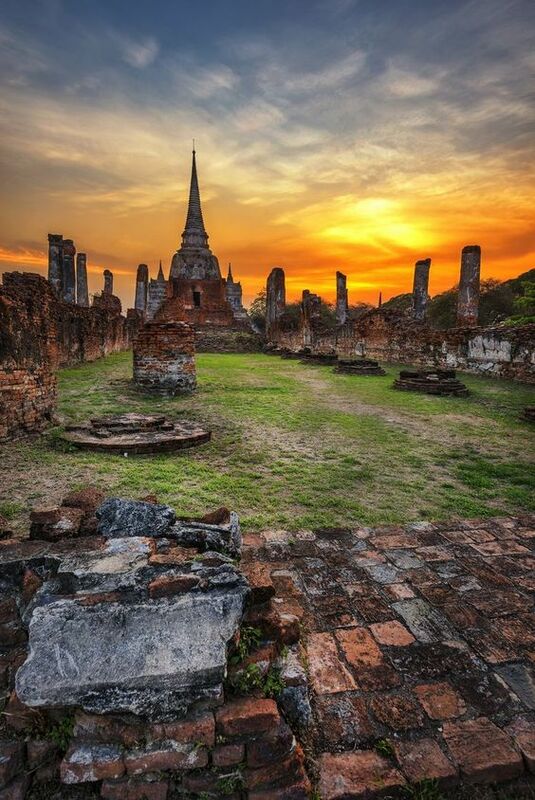 The ancient city of Ayutthaya is a place like no other. You'll get the impression that you're in some kind of time warp. Better than that, you'll be taking home some amazing memories. Check out some of the not so hidden gems below. Wat Phra Sri Sanphet is not only one of the largest ancient architectural sites here in this central Thailand city but it also has some of the finest temples ruins. It was originally built in 1491 in honour of three fifteenth-century kings. The three restored chedi now house their ashes. Open daily from 8:00 am until 5:00 pm. Wat Phra Ram was built in 1369 but later restored during the 15th century and then again in 1941. It is situated across the way from Wat Phra Sri Sanphet in the middle of an island within the Historical Park. The complex consists of a huge towering Prang, some smaller classic style Chedis as well as a few outbuildings. Wat Yai Chai Mongkhon has the largest Chedi located outside of the city and was built between 1590 and 1605. If you climb the stairs of the Chedi, you'll be able to see the beautiful gardens as well as a great view of the city. Lots of Buddha statues to see in the temple grounds including a reclining statue. Wat Phra Mahathat is one of the oldest temple complexes in Ayutthaya dating back to around 1380. It is also one of the most beautiful and is spread over a large area. It's hard to imagine what it must have been like during the prosperous years when first built. The huge Stupa that you see in the complex originally stood 46 metres (150 feet) tall. However, it did collapse later on. Wat Chai Watthanaram is a fascinating sight to behold. It was built in 1630 and is located on the west bank of the Chao Phraya River. From here you can get a great view of this remarkable temple complex. This site originally followed the plans of the Hindu Temple at Angkor Wat in Cambodia. It has a huge central Stupa which sits on a raised platform surrounded by smaller ones. Bang Pa-In Royal Summer Place is located on the banks of the Chao Phraya River about 20 kilometres (13 miles) downstream from Ayutthaya. The present buildings seen today were built in the late 19th and early 20th-century, though the original site dates back much further. The complex is beautifully laid out and the charming collection of palaces and pavilions are displayed in a variety of architectural styles including Chinese, Italian and Victorian. The Royal Summer Palace grounds are open daily between 8:00 am and 4:30 pm.